Michael and Spock center a chaotic, dramatic episode of Discovery. A lot happens in “The Red Angel.” Almost too much happens in it, actually. It is perhaps one of the messiest episodes Discovery has ever done, as it paradoxically drags and dashes through a bunch of plot threads it barely has time to entertain. Some of these moments ultimately ring hollow—the dramatically overbearing funeral for Airiam that opens the episode is an egregious example, given it’s in service of the fact that we learned basically nothing about her until it was time for her to die. So was Burnham’s brief hookup with Ash/Voq, especially since it didn’t really address the lingering nightmare that she broke up with him last season because he tried to murder her. Other moments thankfully anchored the chaos of the episode elsewhere, and we’ll get to that in a bit. Michael, I don’t care that you think you might be about to die. This man tried to murder you, stop! It turns out Airiam’s dying portent that Project Daedalus is the key to everything was much easier for the Discovery to track down than you might have anticipated. Tilly quickly finds a file left behind by the fallen officer that shockingly reveals a bioscan of the Angel is a perfect match for Michael—right as Section 31 shows up to also just casually reveal that Project Daedalus is one of its own research initiatives into time travel, that the group has known what it and the signals are all along, and has just been stringing along the rest of Starfleet while it tries to recover its technology. If that wasn’t enough madness? Georgiou goads Michael into getting Leland to also reveal that her parents weren’t humble scientists, but Section 31 operatives. Not only that, they were tasked with recovering a time crystal to use in Project Daedalus, and the reason for their death was that Leland got careless and let the Klingon operatives also chasing the crystal hunt them down. But there’s still more! Michael and the Discovery crew hatch a plan to catch Future Michael by forcing her into a Grandfather Paradox—by exposing Michael to a situation in which she is about to die, Angel Michael has to save her past self’s life, as she did way back in the premiere. Otherwise, she won’t exist. And in the time she needs to do that, Section 31 and Discovery can trap her in a containment field, disengage the Daedalus suit, and ask her some very pointed questions. The face Pike’s pulling when Spock and his sister reveal that the best plan to bait the Angel involves potentially killing Michael is perfect. Also, it’s a face I pulled a lot in this episode. This is like, way, way too much to throw out there in one go, let alone on the shoulders of one character. At the very least, the revelation of the Red Angel’s identity—and the immediate headspin it and everything surrounding it puts Michael in—gives us the emotional highlight of the entire episode, and arguably the thing that works the most in all of “The Red Angel.” While Michael works out her anger at first on Ash, and then on an army of training dummies, Spock comes to comfort her; in Michael having both her logic and emotional sides thrown into total turmoil by everything flung at her, she is now going through the same trauma he did with the Red Angel’s visions. The same trauma she attempted to inflict on him as a child. And so, instead of sniping at each other over what divides them, at long last, Michael and Spock have something to bond over again, and their relationship can truly begin to heal. It’s a beautifully handled moment and, unlike many other lingering threads from the rest of the season addressed in this episode, one that is given the room it needs to breathe. Really, it’s the scene this episode had to get right, given the importance of Spock and Michael’s arc to the entire season at this point. What better way for “The Red Angel” to find a moment of sense amidst the chaos of everything else going on, than one where Michael and Spock reforge their relationship as brother and sister by trying to do just that? And when the Discovery puts its plan to basically commit attempted murder on one of their own (even if it was voluntary) into action, it gives Michael a sense of peace that she’s made amends with her brother (should she actually be about to die), but also gives Spock the chance to finally put his faith back in her in the process. Even if it means he has to advocate on her behalf to continue the audacious plan at phaser-point, when everyone else on the mission—her captain, her friends, her weird killer emperor mentor from a mirror universe—are too concerned that Michael might be lost for good. Michael and Georgiou share a weirdly touching moment before everything goes sideways. When the twist to your twist is that the twist was actually a fake twist, maybe, just maybe, you have contorted yourself into a dimension of too many twists. In an episode that already had a lot going on, why waste time setting up a twist that existed solely to be revealed as a fake gotcha by the episode’s end? Because if it had been revealed that Michael’s mother was the Red Angel at the point in this episode where it’s instead revealed that it’s allegedly Michael, nothing would’ve dramatically changed. Michael would still have the impetus to confront Leland about her parent’s real careers, and it would’ve been driven by her own desire to discover the truth, rather than through Georgiou pushing her. Spock would still have reason to comfort Michael over logic and emotion failing her, because while it’s less of an existential crisis than literally facing your future self, she’s still facing the mother she thought she had lost decades prior. Hell, the plan to put Michael in lethal danger would still work even without the hard threat of the Grandfather paradox, because—as the episode goes out of its way to establish—the Angel has a precedent for saving Michael every time she is at risk of death. It also would have made Spock’s decision to forcibly prevent anyone from intervening in the capture plan even more heartbreaking than it was, because he’d be putting faith in his sister’s choices understanding they’re out of love for her mother, mirroring his own close bond with Amanda. But instead “The Red Angel” spends pretty much its entire run time setting up a “gotcha!” moment just to... well, say “gotcha.” It’s a twist for twisting’s sake, rather than the story at large. Even putting that twistiness aside, the idea initially presented in “The Red Angel” of Michael being the titular entity is an intoxicating, fascinating one. Through that, we could have began to interrogate Spock’s belief that his adoptive sister’s ceaseless desire to shoulder all burdens, however nobly intended, can have dangerous consequences for not just those Michael loves but also the larger universe beyond her. After all, if Discovery is going to demand that it makes its lead character’s life as rooted into the ephemera of Star Trek canon as possible (escalator of wars, saver of worlds, sibling to famous Vulcans), why not really examine what all that overwhelming importance can do to the psyche of a person? What could happen to a Michael who is given the power to be a literal walking—well, float-flying through space-time—Deus Ex Machina? I was pulling the face Stamets is pulling here a lot too, honestly. But we’re not getting that. Instead, we seem to be heading down the much easier path for Discovery to take, of Michael teaming up with her long-thought-dead mother to fight an evil A.I. from the future. It’s a familiar family drama that the show was already doing a grand job in tackling in Michael’s relationship with Spock. 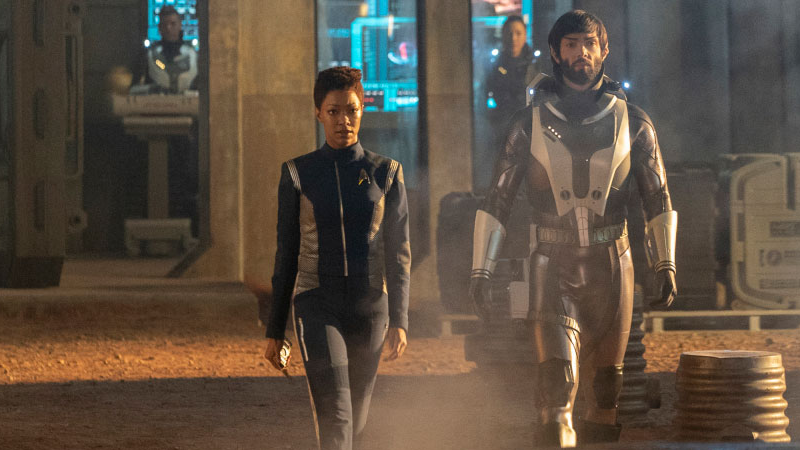 It’s also a path that has, as I mentioned last week, a disappointing familiarity with the trajectory of the first season of Discovery, which pondered fascinating questions only to chase the easiest of answers. At the very least with the real twist revealed—well, as far as we know, who can say there aren’t more twists to twist out of it!—perhaps Discovery’s focus can now be less on who the Red Angel is, and more on the questionable ethical overreaches that lead to its creation in the first place. There are hints of that potential throughout this episode, even as Section 31 becomes (once again) a wary ally against the threat of Control. And this season has been at its strongest when mining that tension over the soul of Starfleet, rather than in mining the familiar rogue AI trope that Trek has covered time and time again. Hopefully, we’ll get to see a bit more of the former as we barrel down into the final stretch, even if we now have a timey-wimey extra layer of messed up family history for poor Michael Burnham to unpack on top of it as we chase the latter. Definitely this face too. Very good faces of complete befuddlement in this episode. There’s a very weird moment just before the Discovery is about to begin its angel capture where Lieutenant Nilsson takes her position on the bridge. Everyone glares at her, of course, because she’s specifically taking Airiam’s position—it’s a weird pause in the scope of the story though, considering everything about to go down. But it’s made even weirder by the fact that Nilsson is played by Sara Mitich, who played Airiam in season one of Discovery before Hannah Cheesman assumed the role for season two. So it was double weird. Another plot thread lost among the hubbub of this episode: the slow path to reconciliation between Culber and Stamets being opened, after the former has a welcome heart-to-heart with Admiral Cornwell (hey, they remembered she’s a therapist! This ship could really do with a counselor). But while I appreciated that thread being built on, I equally appreciated just as much that when Culber tried to bring it up with Stamets just before the mission was about to begin that Stamets was like “this is really not the time.” Because it really wasn’t! This episode had way too much going on as it is!